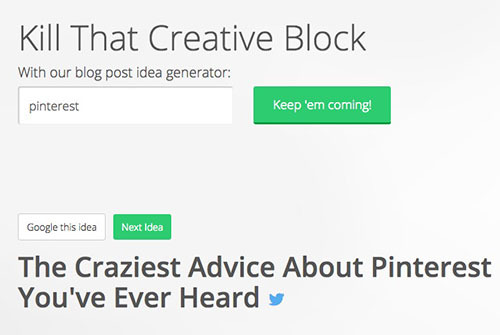 7 Awesome Tools for Generating Blog Post Ideas…for ANY NICHE! June 17, 2018 By Paula Leave a Comment This post may contain affiliate links. We all go through stages where we run out of ideas for what to write about. I get that every now and then but if I wait long enough, I suddenly get hit with a ton of ideas out of the blue. During the lean times however, it’s nice to be able to quickly find something new to write about without having to wait for those ideas to crop up. This was me today. I went scouring the net searching for new blog post ideas. I was actually looking for blog posts on creating amazing headlines because I thought that would give me some ideas. You know, like “7 Ways to Get Your Cat Out of a Tree – The 3rd One Will Amaze You”. Although those types of titles are very clickbaity (is that a word? ), they are a great way of getting new ideas for blog posts and they can work for just about any niche. I found plenty of blog posts on the net with lists of awesome blog post titles that will help to generate traffic but during my search I also came up with quite a few tools that would do the job. With these tools, all you need to do is type in a keyword and you will get a list of results. This is awesome because it means it will work for any niche and if it doesn’t let me know in the comments below. With the tools listed below, it won’t take you a long to generate a ton of ideas for new blog posts. I love this site. Just type in a keyword and it will generate a list of questions people have asked in relation to that keyword. It uses the suggested search results from Google to compile the list. You will have experienced ‘Suggested Search’ when typing something into Google. 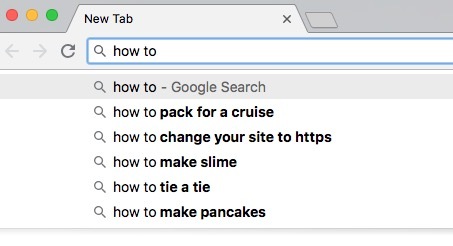 As you type, Google provides a drop-down list of suggested searches. I have only used the free version. The Pro Version allows you to get ideas by region and choose a language. 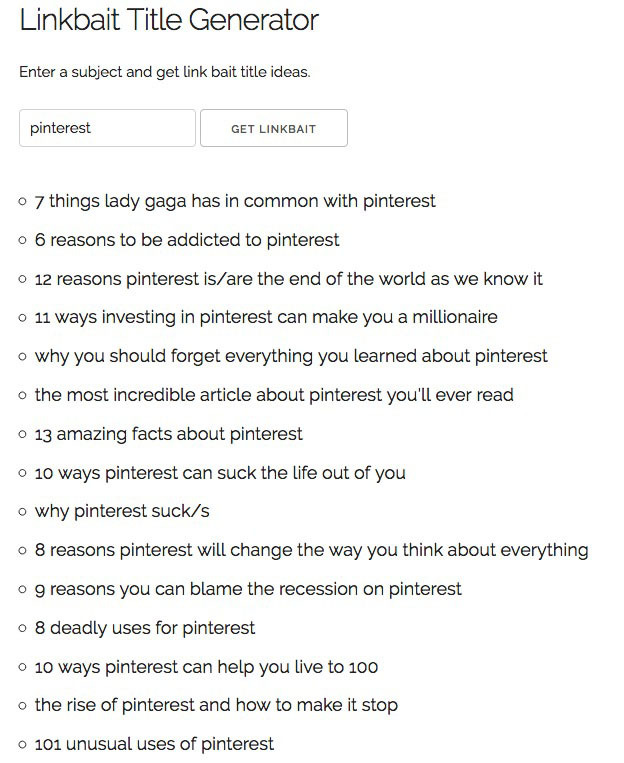 I typed in the keyword ‘pinterest’ and here are the results. Actually these are only partial results – I could access more by scrolling further down the page. Quick Tip: When you get the list of results, click on the DATA option instead of Visualisation to make it easy to read. > GO TO Answer the Public to try it out. This is another favourite. Type in a keyword and it will generate 700 blog post titles for you. Yes, I said 700! This is a great way of getting ideas for what to write about. Bear in mind, that it basically takes your keyword and plonks it into a headline title so a good majority of them don’t read so well, as you can see in the image below. However, the point here is that it is giving you ideas and out of the 700 you will find some real gems. Here are some partial results for when I typed in ‘pinterest’ as the keyword. I can see at least 4 or 5 blog posts I could write about based on just those few that are showing. GO TO> Awesome Title Generator to try it out. This one doesn’t provide you with a lot of ideas – only 5 to be exact but it has helped me generate a few blog posts drafts for other sites. You can sign up with them for free to get more ideas, but personally I haven’t done so. If you do, let me know in the comments below whether it was worth it. 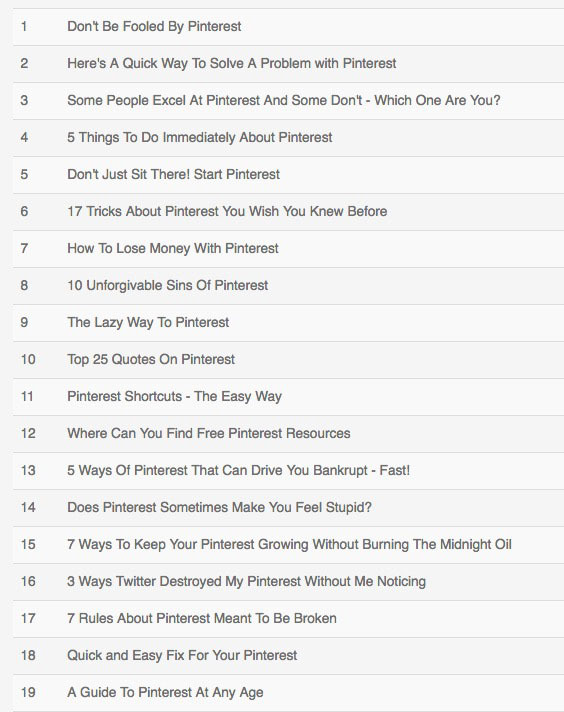 I typed in the keyword ‘pinterest’ and these were the results. This one is a lot of fun to use. I really love using it and it comes up with some great ideas. Enter a keyword and it will give you just one result. But you can click again and again and it will keep giving you different results. These are the results for the keyword ‘pinterest’. I have highlighted it in red where it places the suggestion. GO TO > Portent’s Content Idea Generator to try it out. Simple and to the point and it creates a nice list of titles that will give you some great ideas. Just what you need to start generating traffic. Here’s a partial result for when I typed in the word ‘pinterest’ as the keyword. GO TO > LinkBait Generator to try it out. This one only provides one result at a time but you can keep clicking on the ‘Next idea’ button to keep generating new ideas. Most of the titles made sense so it’s nicely done. This is the result when I typed in the keyword ‘pinterest’. GO TO > Blog Topic Idea Generator to try it out. This one is a little different because you can specify what type of keyword it is ie. brand, event, industry, product, location, person’s name or skill. 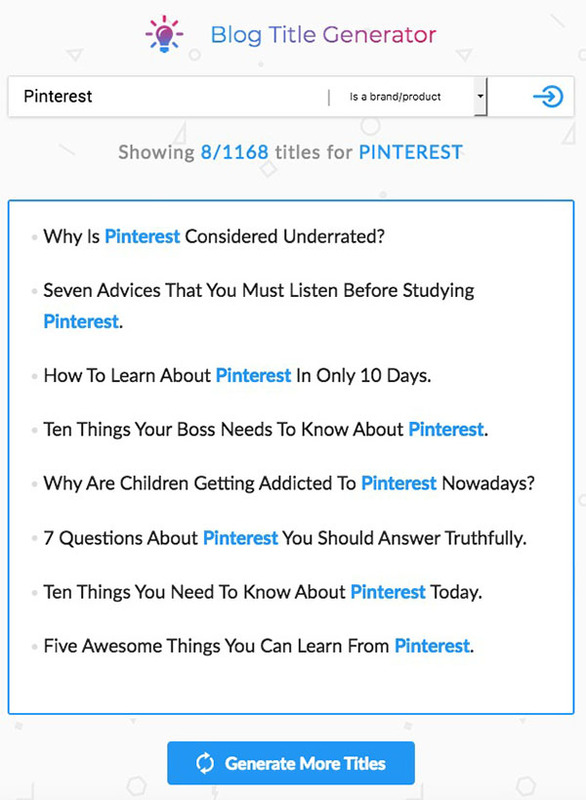 So when I typed in the keyword ‘pinterest’ I was able to select ‘Brand’ which is supposed to result in better results. Well yes it does but the grammar wasn’t great with some of them. However, I was still able to get some valuable ideas from it. Here are the results when I typed in ‘pinterest’ as the keyword. You can see that there is a button at the bottom of the list which I can keep pressing to get more results. HOWEVER, there is a daily limit of 5 and they want your email to get more. I haven’t signed up since I don’t want to be on yet another email list but the option is there if you want to use it. 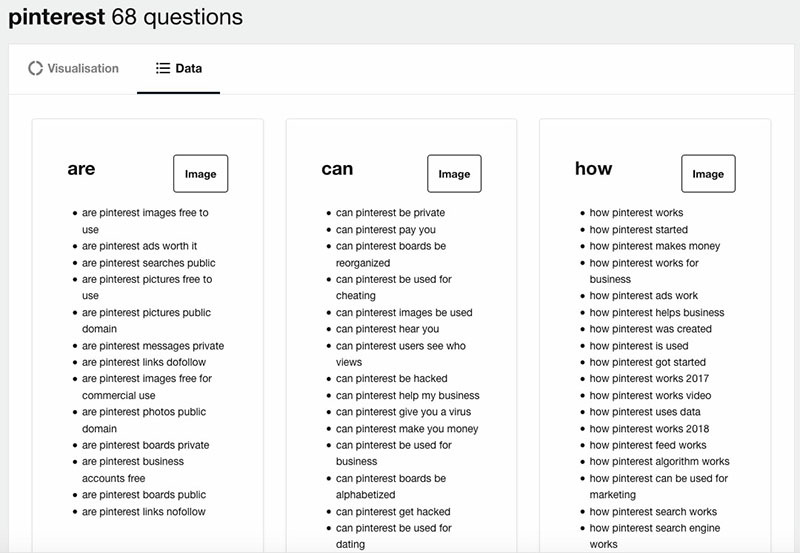 GO TO > Blog Title Generator by SEOPressor to try it out. Hope that helps. Let me know in the comments below whether you have used any of these and if you have any others you want to suggest.